If you’re at all like me, you’ve always wondered what a motorcycle would look like if it had to undergo the same full body scan as TSA victims trying to pass through security at the airport. Thanks to a recent artistic endeavor, your wait is over. 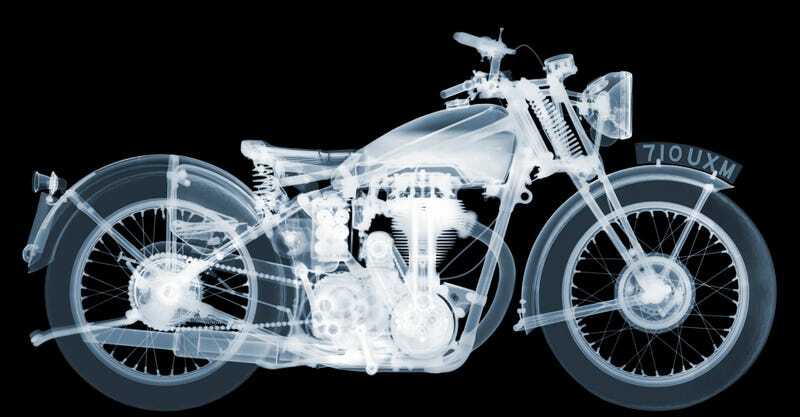 Combining science and art, Nick Veasey’s most recent project in his large gallery of x-rayed objects, peels back the hidden layers some valuable and irreplaceable two-wheeled machines. While the exterior beauty of these golden era bikes is quite obvious, the x-rays tell a different story of skill and ingenuity that was required to design and build these vehicles nearly 100 years ago. Nick and his team must composite multiple photographic films to create a full size representation of the motorcycles. Each bike required about 30 separate x-rays before the film was processed and scanned to produce a digital tile. This digitizing process allows the artist to manipulate the image for clarity, emphasizing or de-emphasizing parts creating a sense of three dimensions for the viewer. Nick and his team worked with private owners to bring several different classic motorcycles into their unique studio used to blast random objects with radiation. Bikes manufactured by Indian, Douglas, and Matchless were wheeled behind the steel door to create a intricate but technical look into the inner workings of mechanical things. Also check out Nick’s Facebook for more examples of his famous x-ray artwork, including some very large objects likes cars and planes, down to very ordinary devices that become extraordinary when you discover details under the surface that you didn’t realize were there.